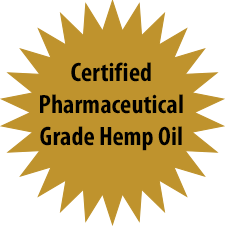 Is a clinically proven Premium Grade Hemp CBD Oil formulated exclusively for Sunshine Global by two public health companies. Hemp Oil is considered a food product by the FDA. It is a high grade Hemp CBD Oil extracted by a super- critical CO2 cold press that insures the top high-grade Hemp Oil with less than 0.03% THC. 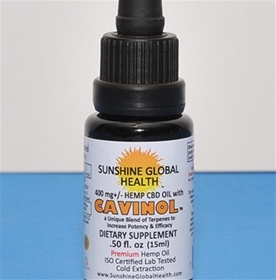 Sunshine Global Hemp CBD Oil comes from the Hemp plant; cousin to the Marijuana plant. However it has NO psychedelic or psycho-active effects. Seeds and stalk are extracted from the Hemp plant to formulate the highest grade raw Hemp CBD Oil. Anxiety ~ PTSD ~ Depression ~ Epilepsy ~ Seizures ~ ADD / ADHD, Cancer, Diabetes ~ Neuropathy ~ Arthritis ~ Chronic Pain ~ Skin Conditions ~ Infections Inflammation ~ Alcoholism and MORE! SUNSHINE GLOBAL HEALTH INSTITUTE was organized by a group of dedicated alternative health associates including health clinics, compound pharmacies, health food store owners, doctors, physician’s assistant, nurses, etc. for the sole purpose of providing high quality, lab tested, legal, insured products in the Hemp CBD and the skin and sun care markets. 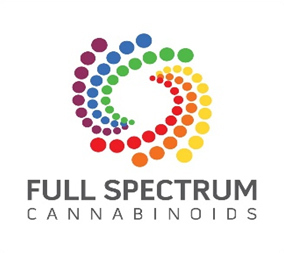 The products that you see here are the "REAL DEAL" premium, highly researched and tested CBD and skin care products, backed by lab and field testing. Some techniques for extracting Hemp use high heat and/or toxic solvents which are dangerous, unsustainable and don't extract the full complement of nutrients from the plant. Even worse, they cannot always be fully separated from the end product, which is therefore not clean or pure. 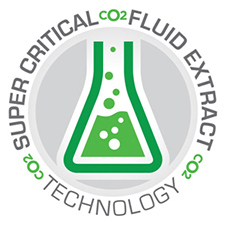 SuperCritical Fluid extraction is a safe, sustainable and superior method. Using state of the art equipment we take harmless Carbon Dioxide (C02) and compress it to upwards of 10,000psi (300 times greater than car tire pressure). At these extremes C02 becomes' supercritical' where it possesses the properties of both a liquid and a gas at the same time. It is also very cold so it does not harm any heat-sensitive nutrients like enzymes or vitamins. 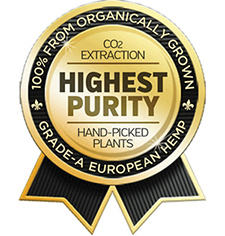 Rated #1 in Purity and Strength Hemp Oil in the Eastern U.S.
CBD may sound like something new but it's not new to us. Perfecting the craft of growing Industrial Hemp has been at the heart of our farmer's family for close to 300 years; passed down from father to son over the centuries.